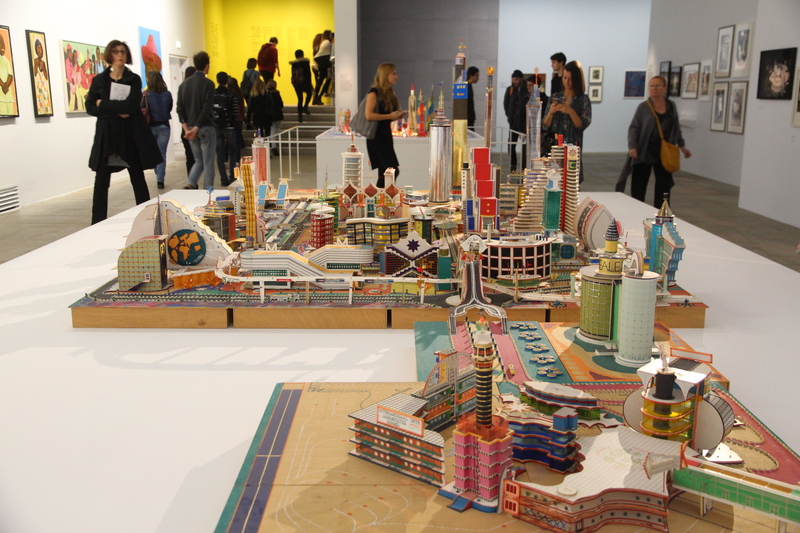 Art from the Congo comes to life in Paris | Where to next? Africa is still one of my favourite continents. Both Poor John and I lived there for a few years, and spent many more remarkable months (in the 1970s and again in 2009) travelling through a swag of countries on the back of a truck. So we were delighted to make a side trip to the Congo while we were in France last month. You might not know that there are two Congos, There’s Congo Brazzaville (slightly more peaceful) and the Democratic Republic of the Congo (known formerly as the Belgian Congo or Zaire). Our brief side trip took us to the latter Congo (or DRC), which is also the more violent and war-torn. Civil war has raged there since 1996 and more than 5.4 million people have died in the conflict. That death toll is almost unbelievable and millions more have been maimed, raped, left homeless and all sorts of other travesties. If you don’t know much about the place, you can learn more here. While the war continues to be heartbreaking and horrific, there’s much more to the country. We had a short but peaceful time there and a most amazing turkey sandwich, but more about that another time. The Parisian side trip was all about art—especially art produced over the last 90 years. The artworks, which I hope will make an international tour, are currently on display at the Cartier Foundation in Paris. The exhibit, called Beauté Congo, features 350 pieces by 41 artists. There are paintings, sculptures, photographs and even some music. Scattered amongst the artworks are music pods, where you can tune into music that reinforces the themes of the art pieces. This is the first-ever retrospective of art from the DRC. Most of the pieces have never been displayed internationally, and have instead ‘lived’ in private collections in Belgium, France and Switzerland. Others have come from Belgium’s colonial archives, while a few others have come from the artists themselves. While I never got pictures of this practice, it is common for DRC artists to hang their paintings outside their studios for all the world to see. This fits with the exhibition itself. Many artworks reflected DRC’s street life—bars, music, dance, flamboyant clothes and cars. In fact, the exhibition’s vibrant main photo (and the one featured on the cover of the exhibition’s book) is of street dancing. It was Poor John’s and my favourite piece. It’s by JP Mika who was born in Kinshasa in 1980. Several early artists had pieces that reminded us of Aboriginal art. They were by Sylvestre Kaballa, Mode Munta, Lukanga and Mwenze Kibwanga. There were two interesting sculptures by people whose names I failed to catch. Sorry. I was sure I’d photographed the ID cards, but can’t find them now. We really loved some of the ancient pieces from the Belgian archives. These included pieces by husband and wife, Antoinette and Albert Lubaki. The images are near the bottom of this post. 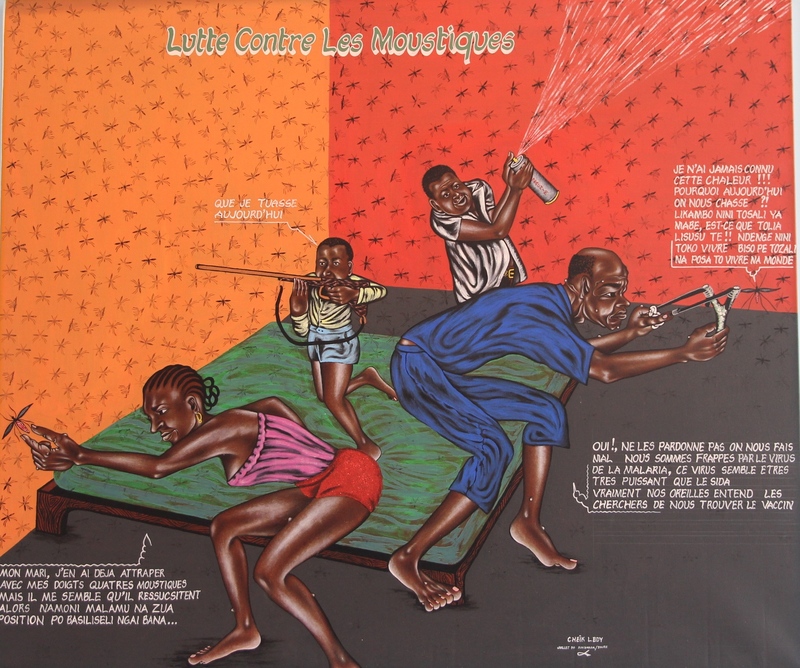 I also got a kick out of Cheik Ledy’s painting of the battle against mosquitos. He/she died in 1997 and I hope it wasn’t from malaria. We spent longer at the exhibit than we’d planned for and have no regrets. The exhibit was supposed to end this month (November), but it’s been extended through January. Great decision. There are two floors of works and another floor of sales. We actually got sucked into the sales, which is most unusual for us. One purchase was an overview of the exhibit. After Paris, we were going to Belgium to stay with a friend who taught in the Belgian Congo for a couple of years. I knew he’d love the overview, so we bought it as a thanks-for-having us-stay-with-you gift. He loved it. Our other purchase was one we dithered over. Poor John spotted it first—a not-so-slim volume of Kim Jong Il Looking at Things. It was a back and forth conversation. I can’t really justify this, he said. Oh for heaven’s sake, you’ll get a lot of mileage out of showing it to friends, I countered. He thought for a nanosecond and bought it. When we got back to Libby’s place, we showed it to her straightaway. Her reaction, Oh thank goodness you bought it. I agonized over whether to buy it and finally decided not to. I guess we know who gets it in the will. Maybe we should have bought multiple copies. Some great pieces of art in there. I love the Mosquito one and the Skol one at the end. Mosquitos in Africa are ferocious. And a decent African beer should taste at least okay cold or warm. Refrigeration isn’t always common. No to the mosquitos but a big fat yes to the cold beer, regardless of make! I had only seen the mosquito the woman wanted to catch and did not see the million others – imagine. That’s a lot of mosquitos! Yes! I didn’t see the others at first but there are hundreds in the picture! I guess you have to see it up close to realise it’s not the pattern on the wall. I too have been a fan of African art ever since my stint there in the 60s. I have several pieces, including the Bush Devil I featured on the front of my book. Thanks for mentioning your book. I just had a look and Amazon says it’s selling price is $70.34 new and $85.87 used. I’m thinking that might not be right. Try “The Bush Devil Ate Sam.” Think $3.99 for the Ebook. 🙂 But I’ll go look. I saw the ebook option, but thought you ought to know about the goofy paperback pricing. Such amazing and beautiful artwork, Peggy. A couple of pieces look almost like Australian Aboriginal artwork. I agree Vicki, some of those pieces are very similar to Aboriginal art. Thanks Helbaby, would love to catch up. Keep me posted. 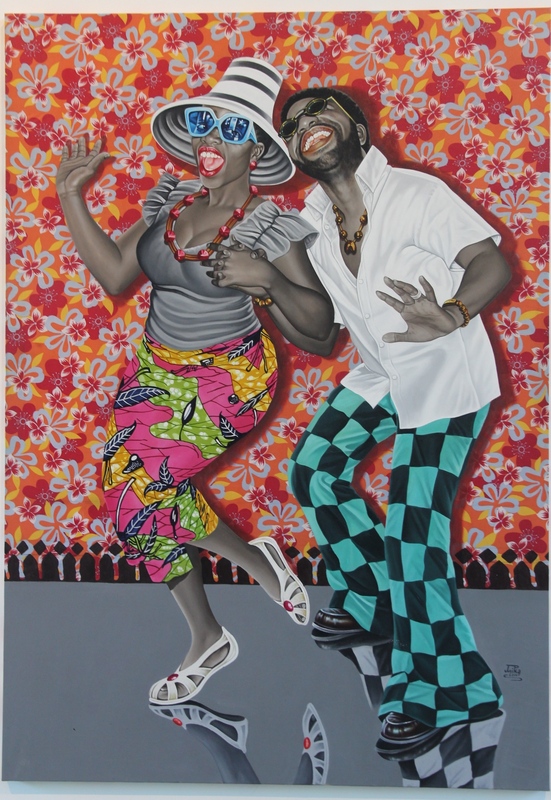 Interesting Blog on art from the Congo. I agree the main exhibit painting by JP Mika is sensational. “PARLE MENTEURS DES PARTIES POURRITIQUES”… A Google Translation- “LIARS SPEAK THE PARTIES POURRITIQUES.” I could not quite figure out the following word so Googled “Pourritiques” and came up with many images and ones shown in this blog. Thanks to my trusty French dictionary, I’ve managed to translate the title. It’s ‘Talking Liars of Rotting Parties’. Pourritiques comes from the verb pourrir, which means to rot. The image implies that it refers to Parliament. Thank you for little piece of Congo. Ledy unfortunately died of aids related complications. Too many in Africa dies from AIDS. Very sad. The colours are so bright. Especially that Skol beer one. and the look on their faces!! 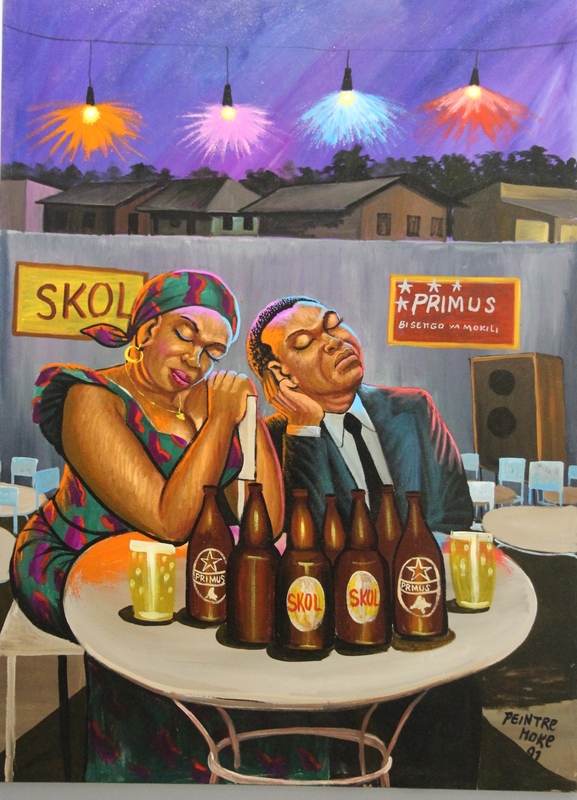 I think I had a couple of beers in the pub pictured in that Skol painting. We were allowed to go to the fridge and pick out the coldest beer. Didn’t matter much because the fridge wasn’t plugged in. Thanks. It was such a great exhibit to see. This is wonderful, Peggy! I’m glad you/PJ bought the Kim Jong Il piece as you’ll never regret it! The “DOT” artist is super and the one looks so much like Australia Aboriginal! Everyone thinks the Kim Jong Il book is hilarious, so we have a lot of fun sharing it. I like the Mandela/Obama painting too. But I could have bought any of the pieces. Pity that nothing was for sale. I LOVE this art collection but my eyebrows went up went I first read you went to the Congo, and the more dangerous one at that. I have health worker friends who’ve helped out over there and have relayed information back to me. Such a lot of suffering has occurred and is still occurring. I feel for the people who live there and hope one day there will be more peace. The artworks are gorgeous and really appeal to me! Thanks for sharing them. I’ve been keen to travel through Africa for a number of years now especially after following quite a few cycling tourers’ blogs. Oh Jane, it’s so valuable to have a comment from someone who has some knowledge of the Congo. The suffering there has been beyond belief, but we were lucky to have a peaceful time there—although some dogs piddled on our tent. Contact me when you want to go to Africa and maybe I can help you to plan. Beautiful pictures! Outstanding post! Love! You and John have done so much and seen so much Peggy! I love this post and it is sad to hear about the war torn areas!! Amazing art Peggy! Thanks so much for these interesting and enlightening posts! You are most welcome. I find it interesting that such vibrant art is produced in a place with such a dark history. Amazing pictures! Thank you for sharing them! Love the post. Some great art from a part of the world we know so little about! Thanks. I need to start writing more about our time in Africa. African art looks totally awesome… so colourful and full of life. I was only thinking, before you mentioned it (honest!) how some pieces reminded me of Aboriginal art. We saw a few wonderful pieces of that when were were in Australia ten years ago. The mosquito picture is so great, and I simply love the exhibition’s main painting. So vibrant! Thank you for the interesting information and photos of African art, Peggy. I’m so glad you are familiar with Aboriginal art. Anyone who’s seen it would notice the link between that and some African art. Thanks for stopping by. You’re welcome, Peggy. It was an interesting and colourful post. . Thank you so much. I’m keen to have a look and follow at your blog too. Hello again, Peggy.Neither of the Delia Smith books I have on my shelf have the recipe in it that I use. The one I Iuse I found online a few years ago. I’ve had a look on Delia’s site today and can’t find the exact recipe for Oat Parkin now. It’s probably just been updated. My recipe is in ounces, for a start, and the ones online are in grams. The link I’m sending is the closest I can find to my copy, so you can check that out for the method (simple melting method). I’d be happy to send the method if you need it but it’s the same as on this link. It’s important to let the parkin cool in the tin before attempting to take it out. It will just break up if you try to lift it out while it’s hot. My goodness Millie, what a lot of effort you have gone to. It’s most appreciated. I’ll give this a try and let you know how it goes. I had done some looking after you first raised the subject and saw that it’s essential to let it cool in the tin. Anyway, thanks heaps. You’re welcome. Peggy. I just wasn’t sure how to get the recipe to you. It would have been far too much in a comment box if I’d written out the method, too. It’s a pity the world doesn’t know more about this war. I’m glad you like it as much as I do. Thanks for stopping by. “War, what is it good for? Absolutely nothing” — from the song written in 1969 by Norman Whitfield and Barrett Strong. These pics make me want to start drawing again. I particularly like the extreme mosquito killer with the rifle, lol. Shame you had to get used to, dare I say it, warm beer. There are some things Africans should never get used to otherwise warm becomes the norm. Thanks so much for stopping by. I really enjoy your blog and hope you start drawing again. Belgian Congo has a sad history, like Congo does now. But the art is vibrant and often full of hope and humour. Fascinating! Thanks so much for sharing this. This is a wealth of color and imagination from a place where we would presume only knows despair and heartache. Proof that the spirit can withstand any darkness. Hello Jean, I always love it when you drop by. You are so right about the resilience of the people in the Congo (DRC). This exhibit was so uplifting.